Sunderland 5k winner Dominic Shaw won yesterday’s Darlington 10k by a street to win the £600 first prize. The New Marske runner, after going through halfway in 15.02, recorded 30.18 to finish 16 seconds outside his own 2017 course record to miss out on a further £150. Durham City Events of the North 5k winner Graham Rush (Cheltenham) finished second in 31.25 and Wondiye Indelbue of Leeds City took third (31.31). New Marske’s Lewis Gamble-Thompson was fourth (32.07) and Sunderland Harrier Kevin Jeffress just failed to catch him in fifth (32.08). The Seaham man finished strongly to have a good run in a field of nearly 2,000 to continue his run of good form. His Sunderland club mate Ian Dixon had his best run of late to finish 11th (34.07) to be first Over-40. Ian Ritchie was 42nd (36.52) and Steven Duffy ended 52nd (37.03).Sunderland Stroller Andy Duke was 51st (37.00). The women’s race was dominated by Birtley’s Tracy Millmore, who was well clear of the rest of her rivals in completing the course in 36.40. She said: “I’m aiming for the York Marathon in October. I will be doing the Gateshead 5k on Wednesday followed by the Teesside Pride 10k and the Great North Run, as I build up to the marathon. 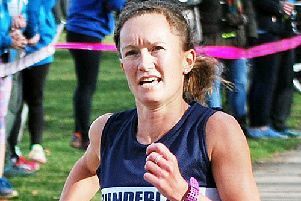 Sunderland Harrier Alice Smith finished fourth woman in a time of 40.34. Houghton Harrier Will Bellamy won the Under-17s 1500m title at the Northern Athletics Championships in Liverpool yesterday (4.09.96) - winning by eight seconds. Clubmate Sam Gibson came fourth in the 3000m recording 9.20.